Eight channels of clean and transparent preamplification, complete with input impedance switching and flexible digital output options. Audient are one of the few companies still doing well in the analogue mixer market, not least because of the sonic quality of their products, though sensible pricing and ease of use must also play a part. The company sells a lot of mixers to clients who use DAW-based studios, such as Pro Tools rigs, but they're also aware that many DAW-based studios mix 'inside the box' and so are more likely to spend their money on control surfaces. Even so, DAWs still need mic preamps, so Audient have very sensibly taken eight of their fine Class-A console preamps and packaged them into a 1U rack unit with optional digital outputs. Technically these preamps are very good indeed, with a bandwidth much wider than the audible 20Hz-20kHz spectrum (-3dB at 300kHz!) and a noise floor that would need you to seriously violate the laws of physics to reduce much further without supercooling the studio! These mic preamps also have switchable input impedance to maintain optimal matching with a range of microphone types, and even the individually switchable phantom power has a soft start so that it ramps up slowly, rather than coming on with a bang. Instead of the usual fixed low-cut filters, each channel has a fully variable 25-250Hz high-pass filter, while the first two channels also have switchable high-impedance instrument inputs and -20dB pad switches accessible from the front panel. All channels have the usual phase switches, so making eight channels fit into a mains-powered 1U rack is no mean feat. One of the savings was to remove 'serious' metering and replace it with 'signal present' and peak LEDs. Given that the recording system to which the Audient ASP008 will be connected will invariably have input metering, whether hardware or software, this really isn't a significant limitation. 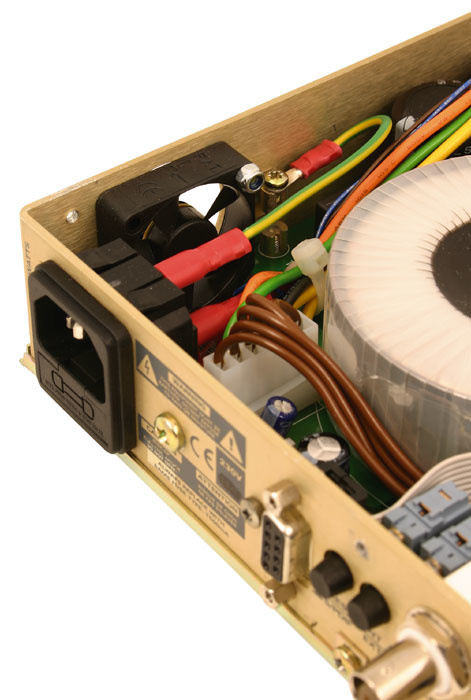 A small quiet fan exits the side of the unit to assist cooling of the power supply circuitry, and it is almost inaudible when the unit is mounted in a rack.Photo: Mark EwingBecause there's a lot of electronics in a very small space, some cooling is required, but Audient have fitted a very low-noise fan to deal with this. In fact it's so quiet that I didn't even notice it once the unit was fitted into a rack, though the case still gets quite hot in the area of the power supply. All eight mic inputs are on rear-panel XLRs, but to conserve the already limited panel space the line inputs and line outputs are on 25-pin D-Subs wired to the commonly supported Tascam DA88 format. Of course DAWs deal in digits, so Audient have made available two digital output options, the first of which is based around an ADAT lightpipe interface and onboard converters, streaming all eight channels into any ADAT-compatible audio interface at up to 48kHz sample rates. The other option card offers a choice of AES-EBU or S/PDIF in addition to the ADAT format, using a nine-pin D-Sub to provide the extra eight digital output streams at up to 96kHz. Both options have word-clock inputs and internal/external sync switching. Either can be retrofitted or fitted at the factory, and a cover plate on the rear of the unit covers the card slot if it isn't being used. Each mic channel has its own section of control panel, with activation buttons for 48V phantom power, line/mic switching, phase invert, and the low-cut filter, as well as a three-way impedance toggle switch (200Ω, 1200Ω, or 5000Ω). The other common controls are a rotary gain control offering up to 60dB of gain and a low-cut frequency control that is continuously variable from 25Hz to 250Hz, with a 12dB/octave slope. The green 'signal present' LED comes on when the input exceeds -25dBu, and the red peak-warning LED illuminates at a level of +16dBu when there's still some headroom left (the maximum output level is a hefty +27dBu). Channels one and two also have unbalanced instrument input jacks on the front panel, instrument switching buttons, and -20dB pad buttons. The legending around these controls is of necessity quite small, but it's still clearly readable in good light. If a digital output option is fitted, the front-panel Sample Rate and Format buttons allow the digital output to be set to either 16, 20, or 24 bits (ADAT only — AES output is always at 24-bit resolution) at sample rates of 44.1, 48, 88.2, or 96kHz, and settings are retained when the unit is powered down. A green LED indicates lock when an external clock source is being used. Audient kindly lent me a bunch of 25-way D-Sub XLR breakout cables, so testing the unit was relatively painless. The harshest test is to use the ADAT output at 44.1kHz, as this tests both the preamps and the onboard converters without the safety net of a high sample rate. Even with modestly priced microphones, there was a marked improvement in noise over the preamps I normally use (and they're not at all bad), but at the same time I felt the sound was also a little more 'open' and detailed. There's no obvious coloration at all, just clean gain — this is one of the things I like about Audient console preamps. This test was done using the ASP008 as the master clock for the whole system, with the ADAT output feeding my MOTU 828 MkII interface. The analogue outputs leave no cause for concern either, as they have bags of headroom. THD + Noise throughout the system is quoted as typically less than 0.007 percent (at 1kHz and any gain setting) and the EIN is -127.5dB with a gain of 60dB and a 150Ω source impedance. This figure isn't uncommon, but what really counts is how much noise is added at lower gain settings where the mic is most likely to be used. Thankfully the ASP008 is extremely quiet at all gain settings, not just at 60dB gain. Photo: Mark EwingThe specification for common-mode rejection is better than 75dB at 1kHz with 60dB gain, and the overall frequency response of 10Hz (-0.3dB) to 300kHz (-3dB) is nothing if not generous. I experienced no trace of radio-frequency interference problems, which are always a danger with such a wide audio bandwidth, and the input amps can tolerate a maximum level of +21.5dB, which means that they have plenty of overload margin and should have no trouble feeding the most level-hungry of audio interfaces. I tried the switchable impedance settings, which to me mainly sounded best in the middle position, but if you have any hard-to-match mics out there, the option to switch could be very valuable. Perhaps this isn't the ideal choice of preamp if you want something that drips with 'warmth' or adds some kind of mystical distortion, but if you just want to hear the sound from your mics as cleanly and honestly as possible, then you'll probably need to pay an awful lot more to better the performance of the ASP008. Ergonomically the ASP008 is easy enough to use, but as soon as you power it up the internal illumination inside the switches is so bright that, even in average lighting conditions, it is almost impossible to read the panel legending. The 48V phantom-power buttons show up blue, so you know where they are, but all the rest are amber, which doesn't do a lot to aid navigation. It's just a small point, as the unit is simple enough that you soon find your way around it, but I feel it is worth mentioning. You also need to be able to access the rear panel to switch from internal to external sync mode, but in most cases, once the unit is installed as part of a system, it's probably going to be a case of set and forget. There's relatively little to say about the ASP008 other than that it puts eight pristine Audient preamps into a compact 1U rack box to handle both mic and line-level signals. Channels one and two also work fine as high-quality DI boxes, though you're likely to hear far more noise and interference from the guitar pickups than from the circuitry inside the preamp. The digital options are straightforward, and allow operation up to 96kHz. I know some people feel the need to double up on this, but I've yet to hear any evidence to suggest that going higher than 96kHz is necessary. Perhaps the ADAT card could have been doubled up to handle higher sample rates using the SMux protocol that stuffs four channels of 96kHz down each lightpipe, but those who need this sample rate can always use the AES option or patch the analogue outputs into converters of their choice. Personally, I thought the preamps sounded fabulous even at 44.1kHz, which is testament to the quality of the converter and clocking circuitry employed here. Audient gear will never be the cheapest, but at the same time they don't charge silly esoteric prices and they deliver great audio quality based on sound engineering principles. Perhaps a dimmer on those status LEDs would have made finding the right button a bit easier, but on the whole, the ASP008 is a great way to add eight channels of very high-quality microphone preamplification to any recording system, digital or analogue. Two practical digital output options. The bright panel lights made it difficult to read some of the button legending. The optional ADAT output card only supports sample rates up to 48kHz. Eight channels of Audient's Class-A console preamps in a 1U box with a choice of digital output options. While not cheap, it's certainly good value. ASP008, £934.13; ASP008ADAT option card (ADAT format only), £293.75; ASP008AES option card (AES-EBU, S/PDIF, and ADAT formats), £411.25. Prices include VAT. Stirling Trading +44 (0)20 8963 4790.